Welcome to the InstantBoss family. I’m so thankful you decided to join us in our journey to Instagram Success! First of all I want to say that this Challenge is for EVERYONE! 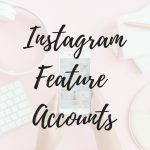 Whether you are a blogger, business owner, or just want to grow your Instagram account, this Challenge will help push you to your goals of becoming an Instagram queen! I am so excited to share all this information with you and I am positive you will see at least 300 new followers by the time you’re done with these lessons, if you put to action what I am teaching! Before we get started with all the fun, I want you to go ahead and join the FACEBOOK GROUP. This is just the tip of the iceberg when it comes to everything I teach in The InstantBoss Club so if you like what you are learning from these lessons you can always join the club. Thanks! I’m looking forward to growing! Ready to kick my Instagram up a notch. Can;t wait to grow my IG!